legal disposal. The process for returning the medications is simple. ​will ask for the name of the medication so it can be disposed of properly. programs for their patients, along with patients of Big Otter Clinic, Clay Elementary School Wellness Center, Clay Middle School Wellness Center, and Clay High School Wellness Center. For details and requirements on the various discount programs offered contact one of our knowledgeable Pharmacists, who will be more than willing to answer your questions. 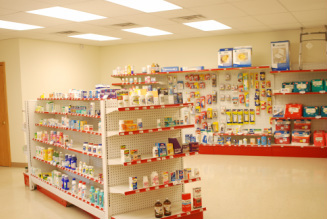 The pharmacy also accepts most major insurances. An automated refill line is available 24 hours a day, 7 days per week to accept your refill requests. Call (304) 587-4555. Talk with your healthcare provider about the convenience and benefits of using the Primary Care Pharmacy and request that your prescriptions be filled here. If you are uninsured, you may qualify for our reduced prescription pricing.